The SI, of course, stands for the school's name, St. Ignatius. The colors of the crest, red and blue, are the school colors and refer to passion and loyalty. The IHS and the three nails inside the sunburst are all ancient images of Christ. IHS are, in Greek, the first three letters of Jesus' name; according to legend, IHS also stands for the Latin phrase Iesus Hominum Salvator, "Jesus the Savior of all men." The three nails are those that were used to crucify Christ; the sunburst is an image of divinity. After three nails were added under the insignia (together with a cross above), some noticed that the inscription now contained a “V” below the IHS – so that we see IHSV. In this form it was adopted by St. Ignatius as the symbol of the Jesuits. IHSV was interpreted to mean In Hoc Signo Vinces, “In this sign, you shall conquer”. It was taken as a reference to the victory which Constantine won against Maxentius at the Milvian Bridge on 28 October 312. Before the battle, the future Emperor saw a sign in the sky (probably the Greek chi-rho X-P, the symbol of “Christ”) and heard the words εν τουτω νικα, which is Greek for “In this [sign], you shall conquer”. The phrase was translated into Latin and it was noticed that the first letters of each word added up to IHSV – thus was born the legend that IHS stood for Constantine’s vision and the Christianization of Rome. The stripes on one side and the wolves around a pot involve some explanation. Several sources, including the 1911-12 Lest We Forget yearbook, relate the history of the seal to Ignatius Loyola's family, one of Spanish noble ancestry. The seal is actually a combination of two family bearings brought together in the 1261 marriage of Lady Inez de Loyola to Don Lope de Onaz. The Loyola bearing, on the left of the heraldry, represents two gray wolves, their paws resting on the handles of a cauldron which is suspended by black pot-hooks. The familial representations of the wolf (lobo) and cauldron (olla) developed into the name of Loyola (lobo y olla). These symbols are supposed to represent the generosity of the Loyola family who, during feudal warfare, provided their soldiers with so much food that the wolves always found something to feed on after the men had been supplied. The Onaz bearing, originally seven red bars on a field of gold, represented the seven heroic brothers of the Onaz family who distinguished themselves in battle. The combination of the Loyola and Onaz family bearings can be found on seals of Jesuit schools around the world. The dexter chief hatchment contains two gray wolves with forepaws upon a black pot and chain on a field of white. 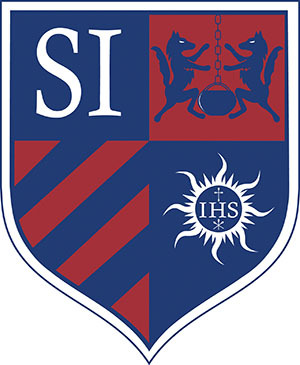 This represents the House of Loyola (lobo-y-olla, i.e., the wolves and the pot), Ignatius Loyola being the founder of the Society of Jesus (Jesuits). The pride of the House of Loyola was that it fed the poor and kept the wolf from its door. Finally, here is a note from one of our graduates about why our crest should be called something else: "I would like to bring something to your attention. You have a section called "Origin of SI Crest." However, what is displayed is not a crest. Instead, it is either called an escutcheon or shield. A crest rests on top of a torse, which in turn rests on top of a helmet, all of which are above the escutcheon or shield. Thought this distinction might be of some value. Thanks! Phillip de Souza ’80"